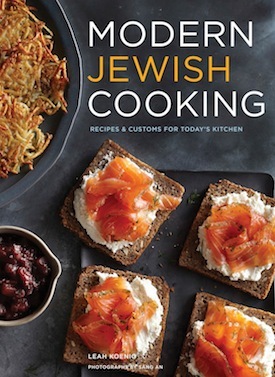 When my husband opened the package with Modern Jewish Cooking: Recipes and Customs for Today’s Kitchen by Leah Koenig (Chronicle Books, 2015) in it, he remarked, “This one you’re going to like!” And he was right. After an introduction on Jewish cuisine and keeping kosher, Koenig suggests how you should stock your kitchen and provides some how-tos. Then, she dives in with 11 chapters, from breakfast to dinner and desserts – 167 recipes – plus holiday essays and menus. These are enhanced by 57 color photographs and 11 essays. As well, Koenig includes all three elements I love in a cookbook: anecdotes or stories about each recipe, ingredients in bold or standing out in some way, and numbered directions. Preheat oven to 375˚F. Line a large rimmed cookie sheet with parchment paper. Whisk together the honey, vegetable oil, brown sugar, cinnamon, ginger and salt in a small bowl. Combine the oats, walnuts and almonds in a large bowl. Drizzle with the honey mixture and stir to completely coat. Spread the granola on the prepared baking sheet. Bake, stirring occasionally until deep golden brown and tasty smelling, 20-25 minutes. Remove the baking sheet from the oven, add the apples and raisins and stir to combine. Set the baking sheet on a wire rack to cool completely. Store in an airtight container for up to one week. Preheat oven to 325˚F. Generously sprinkle both sides of brisket with salt and pepper. Heat vegetable oil in Dutch oven or large pot. Add brisket and cook over medium heat, turning once until browned on both sides, eight to 10 minutes total. Remove brisket and set aside. Add onions, thyme, garlic, bay leaves, 1/2 cup wine and the vinegar. Cook until onions soften slightly, about five minutes. Whisk together one cup wine with honey, onion powder, garlic powder, broth and one teaspoon salt in a bowl. If using a Dutch oven, lay brisket atop onions. If using a pot, transfer onion mixture to a roasting pan and top with brisket. Pour wine mixture over the top. Cover tightly with foil and transfer to oven. Cook for two hours. Remove from oven, uncover and turn meat to other side. Re-cover and continue cooking two to 2.5 hours more, until meat is fork tender. Remove from oven, transfer to cutting board. Cover with foil and let rest 10-15 minutes. Slice brisket, remove thyme and bay leaves. Remove onions and arrange around brisket. Spoon pan juices over brisket and serve hot. Heat olive oil in saucepan over medium heat. Add onions and cook until lightly browned, seven to 10 minutes. Add tomatoes and cook until soft, about five minutes. Add garlic, cinnamon, ginger, cumin, coriander, paprika and red pepper flakes, and cook one to two minutes. Add chickpeas, squash, carrots, raisins, broth and one teaspoon salt. Turn heat to low, cover and simmer about 15 minutes. Uncover and continue simmering, stirring occasionally until very slightly thickened, about five minutes. Bring water to boil in saucepan on high heat. Turn off heat and stir in couscous. Cover pan and let stand five to 10 minutes, until liquid is absorbed. Uncover couscous and fluff with a fork. Mount couscous onto a large platter. Make a well in the centre and fill with vegetables and chickpeas. Spoon a generous amount of liquid over couscous and sprinkle with cilantro. Serve immediately.